PTE ERNEST MURRAY 9TH S.R. Ernest Murray was born on 10th November 1892 in Arbroath, Angus (then Forfarshire), the second of a family of two born to William Murray, from Fetteresso, Kincardineshire, and Ann Davie from Monifeith, Angus, who had married in St. Vigeans on 31st December 1887. In 1891 William (32), Ann (30), and their first child Eva were living in 90 Brechin Road, Arbroath, Angus. William was working as a currier. In 1901 the Murray family was in Demondale Place, Brechin Road, Arbroath. Eva and Ernest (8) were at school. There were two lodgers, David Alexander (28) a lemonade bottler and David Smith (71) a Hackle Maker. By 1911, the family had moved to a 5-roomed house in Kilmacolm Road, Bridge of Weir. William was a leather dresser and Ernest (18) was a joiner in the building trade. There were three lodgers, George Speirs from Blairgowrie, William Martin from Inverness and James Mill from Arbroath, all employed in the leather industry. Ernest Murray had attested under the Group, or Derby, system. If a man chose to attest under the Derby system he would be assigned to a Group based on his year of birth and then placed in the Reserves without pay and allowances except for one day's pay at infantry rates for the day of attestation. The new recruit would then be allowed to return to his home and his employment until such time as his Group was called up. For Ernest, this was early February 1916 when he was enlisted into the 5th Battalion, Scottish Rifles (Regimental No. 567). Private Murray's Medal Index Card does not record when he first joined the theatre of war, but at some stage he transferred to the front with the 9th Battalion, Scottish Rifles, part of the 28th Brigade of the 9th (Scottish) Division. In April 1918 the Division was involved in the First and Second Battles of Kemmel between Armentieres and Ypres, defending their ground against the German Spring Offensive. Between 25th April and 4th May 1918 there were a series of engagements and heavy enemy shelling. We cannot be certain when he was wounded, and it may have been in an earlier encounter, but we do know that Ernest Murray died of wounds on 7th May 1918. He is buried in Boulogne Eastern Cemetery. Boulogne was one of the three base ports most extensively used by the British Army on the Western Front and was also one of the chief hospital areas. Until June 1918, the dead from the hospitals at Boulogne itself were buried in the Cimetiere de L'Est, one of the town cemeteries. The retreat of the 9th Division in April 1918. Ernest Murray was probably wounded in one of the engagements in late April or early May and taken to a hospital in Boulogne, where he died on 7 May. Ernest Murray birth certificate, 10th Nov. 1892. Regd. Arbroath. Forfarshire 25th November 1892. 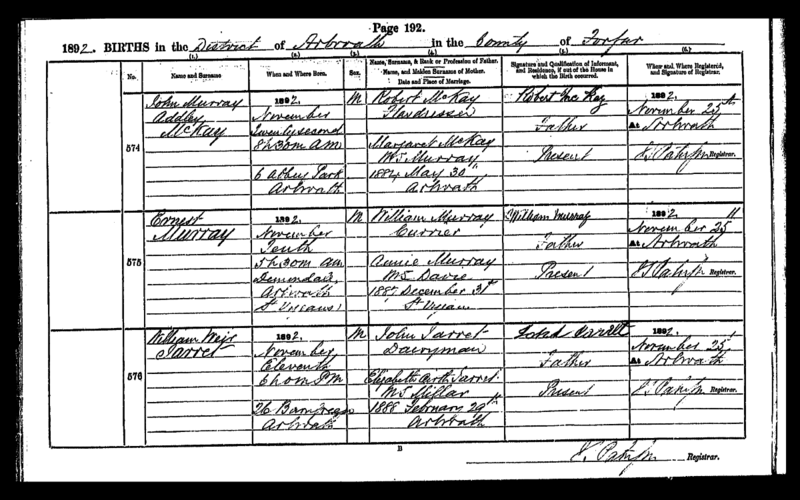 1891 UK Census: Parish: Arbroath and St Vigeans; ED:17; Page:21; Line:21; Roll: CSSCT1891_82. 1901 UK Census: Parish: St Vigeans; ED:17; Page:17; Line:14; Roll: CSSCT1901_86. 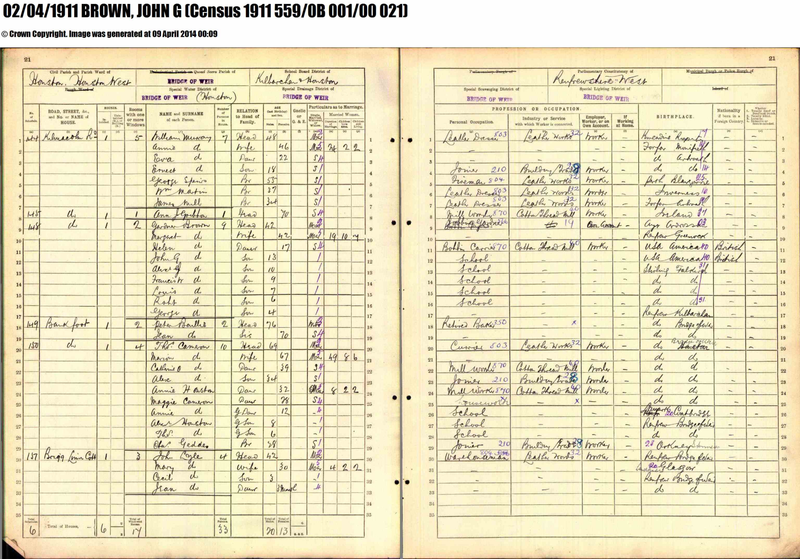 1911 UK Census: Parish: Houston & Houston West; Ward: Bridge of Weir. Page 21; lines 1-7. 559/0B 001/00 021. 5th February 1916: Mr Ernest Murray who was attested under the group system, has transferred his enlistment to the 5th Scottish Rifles, and begins drill on Monday first. (Joiner, Linside Terrace). 10th May 1919: IN MEMORIAM: In loving and proud memory of our dear Son and Brother Private Ernest Murray, 9th Scottish Rifles, who died in France on 7th May, 1918. - To memory ever dear. Inserted by his Father, Mother and Sister. 8th May 1920: IN MEMORIAM: In fond and loving memory of our dearly beloved Son and Brother, Private Ernest Murray, 9th Scottish Rifles, who died in France on 7th May 1918. Ever fondly remembered by his sorrowing Father, Mother and Sister. - Plane Tree Cottage, Bridge of Weir. 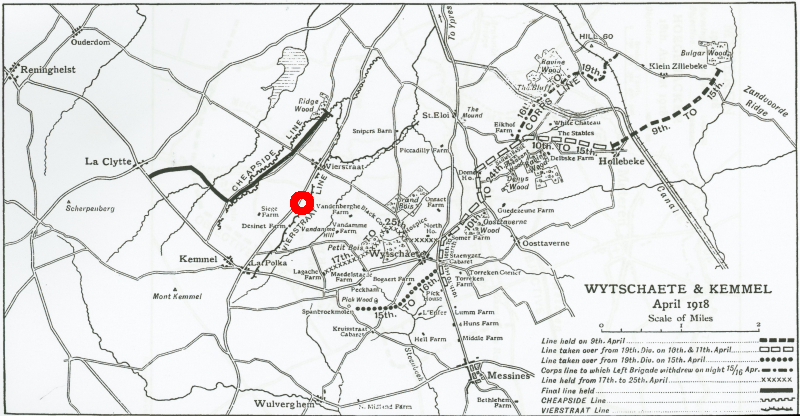 21 April 1918: Battalion entrained at 12.45 p.m. and left WIZERNES at 2.15 p.m. arriving at HOPOUTRE SIDING at 7 p.m. Proceeded to Camp 1½ miles S.W. POPERINGHE near BEDELEM FARM. 22 April 1918: Inspection of clothing and equipment. Training - Company and Lewis Guns. 23 April 1918: G.O.C. 9th Division inspected Battalion at 9.30 a.m. Transferred temporarily to 26th Bde. 24 April 1918: Battalion moved forward from Camp at BEDELEM FARM to the VIERSTRAAT LINE in relief of 8th Bn. Black Watch in Reserve positions. 25 April 1918: Relief completed by midnight. No casualties on approach march. Coys. disposed as follows: (Sheet 28 S.W. 1/20,000). "D" Coy. Outpost Line. N.12.a.1.2. to O.I.c.3.4. "C" Coy. in VIERSTRAAT LINE. "A" Coy. in CHEAPSIDE LINE. "B" Coy in Battn. Reserve in Huts at HALLEBAST CORNER. At 2.30 a.m. enemy opened intense bombardment of our forward and back areas with guns of all calibres, considerable quantity of gas being used. Bn. H.Q. and Reserve Coy. very heavily shelled and suffered considerable casualties. At 7 a.m. "A" and "C" Coys. reported their position intact and slight casualties. No news of "D" Coy. or Battns. in front. A French Company dug in with its left at point H.32.d.3.2. and "B" Coy. thereupon sidestepped to left of road and dug in. At about 2 p.m. information was received that large numbers of the enemy had worked round flanks of "C" and "D" Coys. and that these Coys. had been compelled to withdraw to the CHEAPSIDE LINE. "B" Coy. was pushed forward and at 7 p.m. to reinforce "A", "C" and "D" Coys. in that line. The enemy did not press his attack beyond this point, and at night the Battalion was holding the line from approximately N.5.c. central through RIDGEWOOD to N.6.a.4.2. together with fragements of other units which had been involved ["isolated" scored out] in the withdrawal, in order from right to left "A" Coy. - "B" Coy. - party of Northumberland Fusiliers - "C" Coy. - details of 39th Composite Bde. - "D" Coy. Touch was maintained on right with 22nd Corps Troops, and on left of "D" Coy. with Coy. of Sussex Regt. 39th Composite Bde. 26 April 1918: The night 25th/26th April was quiet on our front. At about 3.30 a.m. orders were received from 26th Inf. Bde. that the French would counter-attack at 4.25 a.m. and that the Battalion in co-operation with the units of our flanks would push out patrols with a view to re-capturing the VIERSTRAAT LINE. There would be no artillery barrage. It was not possible to transmit these orders to Coy. Commanders before Zero hour (owing to the time at which they were received) and when they did eventually reach Coy. Commanders it was found that Units on the flanks had not received them, and consequently the enterprise had to be abanded [sic] owing to lack of co-operation ["preparation" scored out]. At 6.30 a.m. the enemy opened a very heavy bombardment along the whole Battn. front, and at 7 a.m. attempted to advance. He was however driven back by rifle and M.G. fire, but succeeded in pressing back our left Coy. to line. The BRASSERIE at N.6.a. was re-captured by a counter-attack by the Sussex who took a M.G. and a few prisoners. The day passed quietly till 3 p.m. when our line was again heavily attacked after an intense bombardment. The attack was completely repulsed with very heavy enemy losses by Artillery, Machine-gun, and rifle fire. The 2nd Royal Scots Fusiliers moving up from Divn. Reserve reached neighbourhood of Bn. H.Q. and at 9 p.m. moved forward to take over front line, held by "A" and "B" Coys. Relief was completed by 1 a.m. 27th. and the two Coys. relieved moved back to shelters in the vicinity of H.31.d. (sheet 28 I/40,000). Bn. H.Q. moved to Farm at H.31.d.9.2. "C" and "D" Coys. should have been relieved by Units of 21st Division, but this was not done, and they remained holding the line. 27 April 1918: "A" and "B" Coys. moved forward at dusk to occupy positions in rear of the Bde. boundaries in N.9.a., N.8.b., N.3., and N.2.d. (See Appendixes 1 and 2 attached). "C" and "D" Coys. relieved by Units of 21st Division and moved back to positions vacated by "A" and "B" Coys. in H.31.d. Appendix 3. 28 April 1918: "C" and "D" Coys. moved forward to join "A" and "B" Coys. after dusk. Appendix 4. 29 April 1918: At 3 a.m. the enemy opened an intense bombardment of our positions and at 5 a.m. heavily attacked the 2nd R.S.F., but was driven back with very heavy losses. Our 4 Coys. were very heavily shelled all morning, but suffered only a few casualties. The attack was not renewed during the day. The 2nd R.S.F. was relieved by S.A. Composite Bn. after dark. Prior to relief, 2 platoons of "B" Coy. were sent up to reinforce 2nd R.S.F. and returned before dawn. 30 April 1918: Fairly quiet day. Back Areas were heavily shelled from 5 p.m. to 10 p.m. and forward areas from 8 to 9 p.m.
Inter-Coy. relief was carried out "C" Coy. taking up "B" Coys., position and "D" Coy. "A" Coy's. 1 May 1918: Quiet day with slight decrease of enemy shelling back areas. During afternoon "A" and "B" Coys were troubled with French Battery firing into them, after considerable difficulty this was stopped at 3 p.m.
2 May 1918: Enemy's back areas shelling heavier in afternoon otherwise quiet. 3 May 1918: The day was uneventful except for increased aerial activity on both sides in the afternoon, until 8.30 pm when enemy opened a heavy barrage on our front and to the right. Shelling continued till about 10 pm, no attack or raid took place. 4 May 1918: Enemy opened a heavy barrage at 3.30 am which lasted to 6 am, small quantity of Gas being used. Attention was particularly given to front and reserve lines, one bombardment on right (FRENCH) front was very heavy. Day passed quietly. 2/LT J.M. VASS killed and Lt. A. K. STEVENSON wounded. 5 May 1918: Quiet day with intermittent shelling. Heavy thunderstorm during afternoon, Battalion was relieved by one Company 2nd Yorks and one Company 2nd Bedfords. 6 May 1918: Relief complete by 12.30 am. Proceeded to OUDERDOM and entrained for HOPOUTRE SIDING. Arrived there at 4.30 am and proceeded to LORNA CAMP. At 9.30 am, 220 Officers and other ranks embussed for HEURINGHEM AREA, remainder following in afternoon. Companies disposed as follows:- H.Q. and "A" Company at BANDRINGHEM Sheet 36a A.10.c.5.1. "B", "C" and "D" Companies at CAMPAGNE Sheet 27 S.2.9.b. 7 May 1918: Day of rest, cleaning up. o Murray, R. [sic]: Private: 201729: 9th Battalion: France 7/5/18: Bridge-of-Weir.